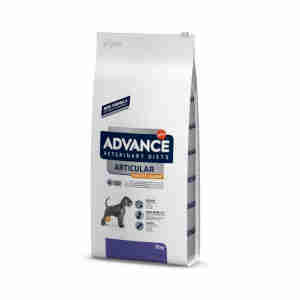 Recommended by vets and with clinically proven effects, Advance Veterinary Diets Light Articular Care contains essential ingredients that can help combat arthritis, inflammatory joint issues, abrasion and osteoporosis. It is low in fat and calories, meaning this wholesome, flavoursome diet can help reduce your dog’s weight. Advance Veterinary Diets Light Articular Care also contains plenty of protein, which can support healthy muscles as well as encourage an optimum weight, relieving overloaded joints and supporting stability and overall wellbeing. The hyaluronic acid can reduce inflammation of joint mucosa, ensuring joints can move smoothly. Vitamin K2 keeps bones supplied with minerals, helping to combat osteoporosis and reduce the risk of fractures. Omega-3 fatty acids, glucosamine and chondroitin all help to keep your dog’s joints and cartilage healthy. This clinically proven mix of vital nutrients visibly supports your dog’s wellbeing and mobility. Advance Veterinary Diets Light Articular Care is a suitable dish for any dog with joint problems or for after an operation, as well as for use in combating osteoporosis and abrasion caused by obesity and weight issues. Bon produit pour un chien un peu obèse avec des problèmes articulaires dus à l'age. Bonne digestibilité et bonne acceptation par le chien.